Featured at My Book, The Movie: An American Odyssey: The Life and Work of Romare Bearden by Mary Schmidt Campbell. 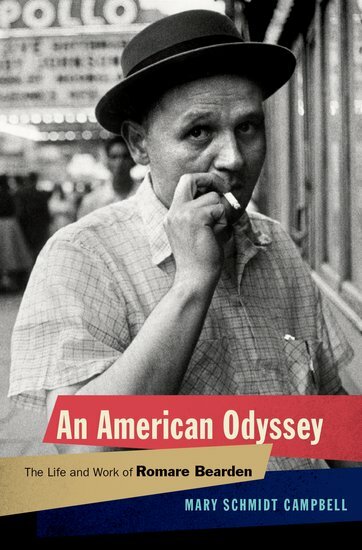 Netlfix would be my platform of choice for An American Odyssey: the Life and Work of Romare Bearden. A six part series would open with a middle aged Bearden hospitalized in Bellevue, having “blown a fuse” and suffered a nervous breakdown. His once moderately successful career as a painter has disintegrated. His efforts at becoming a songwriter and amassing enough money to return to Paris, the city that made him feel liberated, have failed. The action begins with him sitting a table at the hospital, therapeutically making “arts and crafts” as a flashback returns the action to his coming of age as an artist in Harlem, “when Harlem was in Vogue.” The next two episodes recount his mother’s dazzling dominance among the Black middle class and his rebellion against this “respectability” and rising fame as a radical activist and race man. While his mother hosts salons and writes the social column for the Chicago Defender, Bearden immerses himself in his day job, casework with Harlem’s poor and spends his nights with the “Dawn Patrol” in the definitely anti-uplift scene of Harlem’s often transgressive cabarets. Learn more about An American Odyssey at the Oxford University Press website. My Book, The Movie: An American Odyssey. Pg. 69: Catharine Riggs's "What She Gave Away"
What is Paula Munier reading? What is Roger Johns reading? Pg. 69: Peter Blauner's "Sunrise Highway"
What is Jacob Stone reading? Pg. 69: Dave Zeltserman's "Husk"
What is Peter Blauner reading? Pg. 69: Roger Johns's "River of Secrets"
Pg. 99: Ann Pearlman's "Infidelity"
What is A.J. Banner reading? Pg. 69: Jacob Stone's "Cruel"
Pg. 99: Rachel Plotnick's "Power Button"
What is Ashley Weaver reading? Pg. 69: Claire O’Dell's "A Study in Honor"
What is Inman Majors reading? Pg. 69: A.J. Banner's "After Nightfall"
Pg. 99: Marcia Bjornerud's "Timefulness"
What is Tim Pratt reading? Pg. 69: Ashley Weaver's "An Act of Villainy"
What is Katie Sise reading? Pg. 69: Sofka Zinovieff's "Putney"
What is David Sosnowski reading? Pg. 69: Margaret Mizushima's "Burning Ridge"
Pg. 99: Tanya Marquardt's "Stray"
What is Stephen Aryan reading? What is Sofka Zinovieff reading? Pg. 99: Adam Kotsko's "Neoliberalism’s Demons"
Pg. 69: David Sosnowski's "Happy Doomsday"
What is Margaret Mizushima reading? What is Eric Jay Dolin reading? Pg. 69: Mary Kubica's "When the Lights Go Out"
What is William Boyle reading? Pg. 69: Chad Zunker's "Hunt the Lion"
Pg. 99: Candice Delmas's "A Duty to Resist"
What is S. M. Thayer reading? What is Chad Zunker reading? Pg. 99: Sarah Anne Carter's "Object Lessons"
What is Caz Frear reading? Pg. 69: S. M. Thayer's "I Will Never Leave You"
Pg. 99: Anne Balay's "Semi Queer"
What is Julia Buckley reading? What is David Gordon reading?